Go Ah Ra was first offered the lead female role, but declined. Thanks God the lead female role was not Go Ah Ra, its quite annoying to see her flat expression face in so many drama this year.. It sounds a good drama. It will release on my month birthday. That’s so great. Hope that it’s an interesting drama. Come on, Gong Seung Yun. I really exciting for waiting this kdrama.. ohhhh my seo kang joon.. his brown eyes are so cool.. 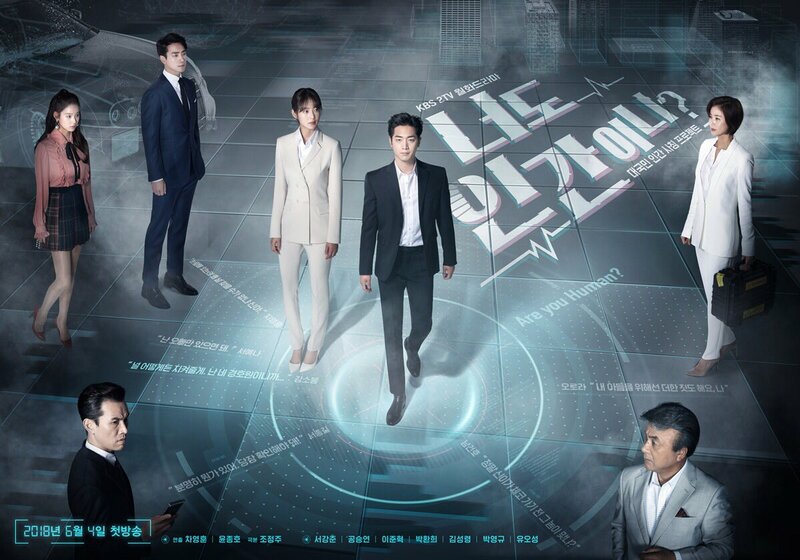 I watched the first episode, it was interesting and you wish to watch next episode but the only thing is the robot is extremely like human being . Means even its so advanced r robot some secne makes you thinkful. Lol! The dilapidated gym that appeared in “Snow Queen” (2006) deserves a mention in the credits. I was pleasantly surprised to see it hasn’t been knocked down and turned into a car-park. Now I hope it remains as a cultural heritage structure that makes cameo drama appearances now and again. Thanks God the female lead isn’t Go Ah Ra, coz its quite annoying seeing her in many drama in whole year, with the no-improvement acting skill, good looking only.. Seem like Seo Kang Joon and Gong Seung Yun have the same eyes color ?? Drama is interesting. I’m sorry for Go Ah Ra, but I’m really happy that she is not main female role. Gong Seung Yun (So Bong) is a delightful actress. With respect to her craft, she’s a class above the male lead. She is so natural and never dull. Drama about cyborg again? Im so bored, why korean creative team lost their fresh idea? So happy to see Lee Joon Hyuk!! He fits well with this kind of character.. then only can see his powerful acting! Fighting!! Kudos to male lead, Seo Kang Joon! He undoubtedly is perfect for this character and he depicted seamless facial expression. Since it’s mainly about the intelligence of an AI, hopefully the plot did not have anything that unreasonably exceeds what AI is capable of in reality. Looking forward to upcoming episodes which pertain sensibilities. Wow I like this drama so far, Love the main guy, beautiful brown eyes. I hope it doesnt have a weird sad ending. I hope it will be a nice cute happy ending. Enjoying watching this kdrama and it sad if namsin 3 will kill the bottom.. Hope there is a happy ending. Oh God, was this written for Netflix? Awful! This drama become less credible but I have to say it Seo Kang Joon is remarkable in his roles. WOW SUCH A GREAT DRAMA SO FAR, PLEEZ DO NOT RUSH THE END. HOPEFULLY ITS A GREAT HAPPY ENDING. THE ROBOT IS VERY KINDHEARTED TOWARD THE GIRL TRULY HAS HUMAN FEELINGS. THATS GREAT, CUZ THE REAL GUY, HE IS NOT NICE, MEAN, SPOIL ALL OF THE ABOVE, THATS WHY THE GIRL HATES HIM……..DON’T BLAME HER. The chemistry between the real Nam Shin and So Bong is so strong, but they do not see it. He sees her just a worker, okay reality check, shes saving you right now thru the robot. He is really selfish, arrogant, spoil and he needs to change his attitude thru life, because everybody is trying to help him. I am so anxious about this drama that I hardly can wait for Mondays to be here. I have to start getting ready for my box of tissues. This is a robot for crying aloud??? How can he feel in order to become a human? Looking forward to the author’s creativity to wrap it up with an ending that makes sense but I know it will be sad!!! I must say this drama should be getting a 20 or above rating. Can’t believe the low ratings. This drama is on point with the story-line and acting from all cast. Two thumbs up. Such an entertaining drama, and worth the time to watch! The main actor’s acting skill is daebak! Koreans just don’t like sci-fi or anything sci-fi related, not surprised by the ratings. Out of all the K-Dramas that have aired to this date 7/2018. Are You Human Too should be in the top 10. Ok folks, this is not intended to be like a work of Shakespeare. It’s meant to amuse. So, sit back and be amused. Growing up I enjoyed the Japanese monster movies, but nowhere did I ever believe they anything other than fun to watch. I taught my children the same thing when they saw or read anything…take it for what it’s worth…fact is meant to reveal and learn; fiction to enjoy (and if you don’t like it, turn the knob). Enjoy, amuse, be disappointed, but you have the power not to watch or listen. Love , love this drama a lot, I will rate it number 👍🏽Drama of the first half year, but how’s come the rating are so low.. So disappointed with the ending. Wasted my time watching this. Done watching, love this drama, worth to watch..
romance with a robot, only in kdramas! it’s a good watch! It was awesome drama with mix of sci-fi romance comedy action. I love the script with suspenseful and unpredictable plot. The director did great job choosing talented casts and beautiful filming setting. The OSTs are good especially the one sang by LYN. Seo Kang Jun and Gong Seung Yeon acting are superb, beyond my expectation. I hope they will win some awards later this year. Another thing that I love is Seo Kang Jun and Lee Jun Hyuk make up, style and fashion. They are too handsome for my eyes. haha. Though I’m bit disappointed with Lee Joon Hyuk’s role. I wish he shone more in the drama, not just being an obedient secretary. I wish they extend the drama till episode 40. Ep 35-36 were too packed with them trying to end everything and the final episode feel a bit incomplete. But still overall I love it sooo much and now i’m watching this for the second time! Seo Kang Joon, I am very proud of you. You did awesome job. I do appreciate your hard work. I am your big fan from Singapore. Wow, Super acting Seo Kang Joon. Love you! The best drama Series of Seo Kang Joon.. I really enjoy watching.. Im so proud of kang joon and the staff.. Im your big fan from philippines. I thought I wouldn’t like this drama… BUT I was wrong. THIS IS SUCH A MASTERPIECE! and I highly recommend it!